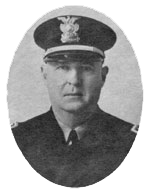 Thomas Grady Head, was appointed sheriff by County Judge Wiley O. Couch to fulfill the unexpired term of Fred Payne, who resigned in late 1943. Law enforcement was Head’s career, and he had served many years in the Chattanooga Police Department prior to his appointment as sheriff. Retired police veteran, Ollie C. Fitz, remembers Head for his humor and likeable personality, “New officers quickly became friends with him and respected his years of experience,” recalls Fitz. Head and his wife, Clara, were residents of East Lake where the sheriff was considered a “political power” in the area. Having served the unexpired term of office, Head ran unopposed for the nomination to succeed himself in March of 1944. He was given a complimentary vote of 14,851. Head and his deputies gained national attention in 1945 for once enforcing Tennessee law, which forbade the handling of poisonous snakes by a religious group in Harrison. The group based its beliefs upon their interpretation of certain Bible verses from the book of Saint Mark. 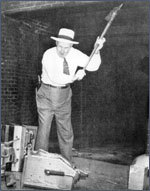 At another time, during the funeral of a snake handler, thousands of curious spectators attempted to see the deadly ceremony that was to take place within the church. The basket was placed in front of the pulpit. The deceased had been bitten by a rattlesnake earlier that week and had died because he refused medical treatment. Now, the church was honoring his request for a three-hour full service. Head had asked the presiding minister to hold the ceremony behind a roped-off section, which permitted only the congregation and members of the press to pass. Those who gathered around the casket began praying and speaking in tongues. Rattlers buzzed above their prayers and the followers began to play musical instruments and chant. The chanting soon grew louder, and to the sheriff’s surprise, church members began to pass around five large rattlesnakes and a copperhead. After completing his second full term, Head returned to the Chattanooga Police Department as a captain.